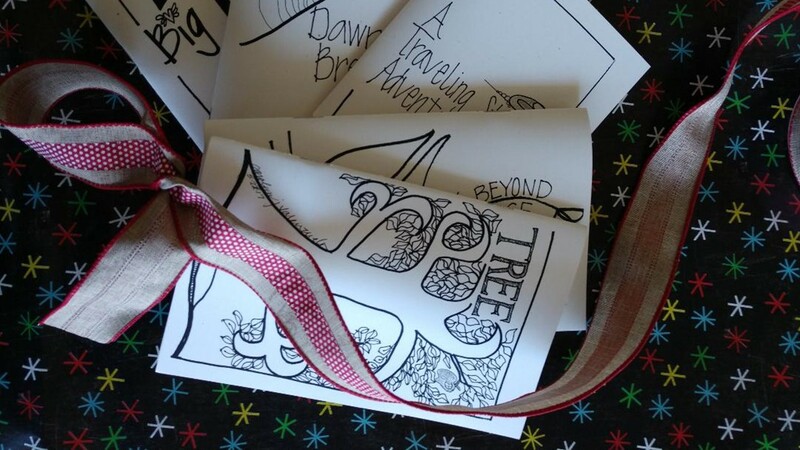 Why choose one zine when you can have the entire set of five little books? TREE – The importance of a tree in a little girl’s life, as told by the tree. Big T Truth – Simple questions shows how easy it is to tell your truth. A Traveling Stone’s Adventure – Become curious about the movement of a perceived inanimate object. Look Beyond the Edge – Slow down and take a moment to really go further than the familiar. Dawn Breaks – The early morning holds the wonder and mystery of a sunrise. There is a lot more happening than night turning into day. Carolyn J Valenzuela wrote and illustrated the books. Share with another as a greeting. Hold, read and reflect for yourself. Chat with others as you color the pages. Plus, look for the recurring image on each page of the book. Can you find them all?